With today’s high-speed lifts and ski slopes buffed to baby’s bottom smooth, you can easily have ten by ten (10 runs by 10am). Maybe “après ski” needs to be redefined for our fast-paced, short-interest society. A plate of nachos and a TV screen may not be entertaining enough for the multi-tasking, must-do-it-all weekend warriors. Of course, you can still have your beer and live band adult-style après ski in your ski boots. Ski Resorts recognizing this trend are adding amenities away from the snow to amuse you after you have carved out your alpine time. This is good news for families, especially teens with nanosecond attention spans, and for non-skiers that tag along on ski trips but find base lodge bench warming to be less than stimulating. Now you can zipline at ski resorts, or snow tube, or snowshoe to a yurt for candlelight dinner and star gazing. Ski Resort have outdoor heated swimming pools and spas, Mountain Coasters and Climbing Walls, themed movie and game nights to keep you amused beyond the alpine and cross country skiing options. Stowe has my kind of après, shop till you drop on the Mountain Road. But for a healthier way to end your day – The Swimming Hole is a fantastic place for indoor water play. Modeled after a classic Vermont red barn, this community project with a competition-size pool was funded by Jake Burton – giving it immediate cool factor. Parents will find a wading pool and a kid-size waterslide. Staying at the mountain, at Stowe Mountain Lodge, you have an outdoor pool with three hot tubs, an ice rink for skating, snowshoeing, and a Performing Arts Center with family entertainment. Vail Colorado has a mountaintop Adventure Ridge, ride the Eagle Bahn gondola from Lions Head to a winter playground of zip-lines, tubing, snowmobiling, and a mountain coaster. Parents can go to scenic Bistro Fourteen in the lodge for an après ski drink. Tuesday’s apps are on specials, and there’s Wine Wednesday among other deals, like kids dine for just $10. The Gondola back to Lion’s Head runs till 9pm most nights. Sugarloaf is the place if gravity gets you down (so to speak). CVA’s Antigravity Complex (AGC) is the place to “hang” after skiing. CVA’s AGC is a world-athlete training facility, part of Carrabassett Valley Academy’s campus where the private student skiers and snowboarders work out, practicing aerials and maneuvers indoors before taking it up onto Comp Hill. AGC is open afternoons for the public to use the rock climbing wall, the trampoline with harnesses, the wooden skateboard bowl and park, plus basketball courts and a running track. The Sugarloaf shuttle can take you from your condo to the complex for free. AGC is 20,000-feet of athletic action, all for reasonable fees. And, you never know when you might bump into CVA’s next Olympic bump skier on the weight bench. All this antigravity comes with a heavy liability release form, not much different than skiing (have you ever read the back of your lift ticket?). If skiing at Sunday River is not a big enough day for you, try the Sunday River Zipline at South Ridge or tubing. Kids can enjoy ice skating at White Cap while Mom & Dad enjoy a brew and Sriracha Tator Tots, or wine and their meat and cheese plate with blueberry fig jam on a beautiful wooden board in the shape of the state of Maine at Camp in the slope side Grand Summit Hotel. Bethel’s free Mountain Explorer shuttle brings the kids, and the family, to the movie theatre in town or the fun Matterhorn aprés ski bar which is both family-friendly and local infused. 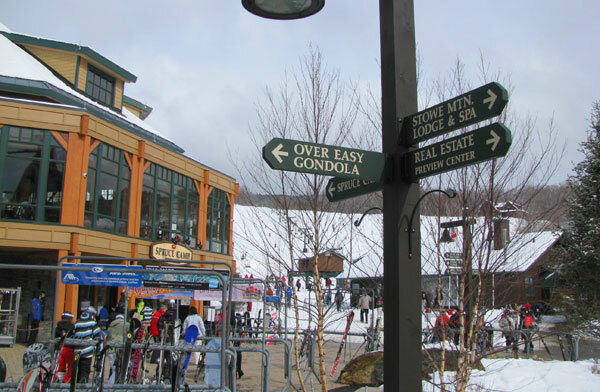 New Hampshire’s Gunstock has a mountain coaster and the most exhilarating, best Zipline in the East, a perfect compliment to your day carving Gunstock’s scenic slopes is soaring above the ski trails on the longest zip span on the continent. Bretton Woods also has a Zipline Canopy Tour for adrenaline seekers, as well as dog sled rides and a climbing wall in the base lodge. Big Sky in Montana has ziplines too, and you can view the zip and teh big outdoor pool from the Carabiner bar in the Summit Hotel. For a really special Montana excursion, you can tour Yellowstone National Park in winter, a short drive from Big Sky, to see Old Faithful geyser, bison, elk and even coyotes and wolves via snowcoach tour or on snowmobile through the park. So next time you are in the mountains, wrap up your skiing so you can have more après ski amusements. It makes for good water cooler chat on Monday that you carved Sugarloaf’s White Nitro then banked turns on Maine’s biggest skateboard park all in one day, or skied Lone Peak at Big Sky before watching Old Faithful blast off in Yellowstone in the afternoon.